This volume is based on lectures delivered at the 2016 AMS Short Course “Rigorous Numerics in Dynamics”, held January 4–5, 2016, in Seattle, Washington. Nonlinear dynamics shapes the world around us, from the harmonious movements of celestial bodies, via the swirling motions in fluid flows, to the complicated biochemistry in the living cell. Mathematically these phenomena are modeled by nonlinear dynamical systems, in the form of ODEs, PDEs and delay equations. The presence of nonlinearities complicates the analysis, and the difficulties are even greater for PDEs and delay equations, which are naturally defined on infinite dimensional function spaces. With the availability of powerful computers and sophisticated software, numerical simulations have quickly become the primary tool to study the models. However, while the pace of progress increases, one may ask: just how reliable are our computations? Even for finite dimensional ODEs, this question naturally arises if the system under study is chaotic, as small differences in initial conditions (such as those due to rounding errors in numerical computations) yield wildly diverging outcomes. 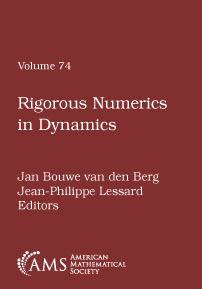 These issues have motivated the development of the field of rigorous numerics in dynamics, which draws inspiration from ideas in scientific computing, numerical analysis and approximation theory. The articles included in this volume present novel techniques for the rigorous study of the dynamics of maps via the Conley-index theory; periodic orbits of delay differential equations via continuation methods; invariant manifolds and connecting orbits; the dynamics of models with unknown nonlinearities; and bifurcations diagrams. Graduate students and researchers interested in theoretical aspects and applications of numerical methods in dynamics.